As the momentous 2018 midterm election cycle gives way to the even more momentous presidential cycle of 2020, it’s tempting to overlook the contests regularly and specially scheduled for the year just ahead. They will be of more than local interest, as donors, activists, and pundits treat them as dress rehearsals for the Big Event, much as the Spanish Civil War was a devil’s appetizer for World War II. One variable is hard to predict with any precision: Will the Trump administration deal with its personnel turnover problems by dipping into the congressional ranks? If so, there could be some special elections of note like those that enlivened the off year of 2017 (deaths, illnesses, and criminal indictments could create some vacancies as well). More reliable are the gubernatorial elections in three states, Kentucky, Louisiana and Mississippi, along with legislative elections in Louisiana, Mississippi, New Jersey, and Virginia. The gubernatorial races are all in states that have leaned heavily Republican in recent years, but they do feature some serious competition and genuine suspense. Kentucky: Can partisanship save Matt Bevin? The Bluegrass State’s incumbent Republican governor, Matt Bevin, first gained national attention as an unsuccessful right-wing primary challenger to Mitch McConnell in 2014. He parlayed the name recognition from that race into a gubernatorial bid the next year. Bevin won a crazy-close and contentious three-way primary (his victory margin was 83 votes), and had an easier time in this Republican-trending state dispatching Democrat Jack Conway in November. According to Morning Consult, as of October Bevin’s job approval ratio was at a terrible 30/55. There are two well-known Democrats already in the field vying to oppose him: Attorney General Andy Beshear (son of Bevin’s predecessor Steve Beshear) and House Democratic leader Rocky Adkins. Both led the incumbent in a recent Mason-Dixon poll. Bevin’s ace in the hole could be his party, though. Despite his unpopularity and the bad publicity he had generated on Medicaid and pensions, Republicans maintained their supermajorities in the both state legislative chambers in the recent midterms. And chronically low job approval ratings (he’s America’s least popular senator back home) have not kept Bevin’s conqueror Mitch McConnell from being routinely reelected. The Cook Political Report rates the race as Lean R.
Louisiana: Can John Bel Edwards overcome his state’s partisanship? Louisiana is arguably a step beyond Kentucky in its political evolution. 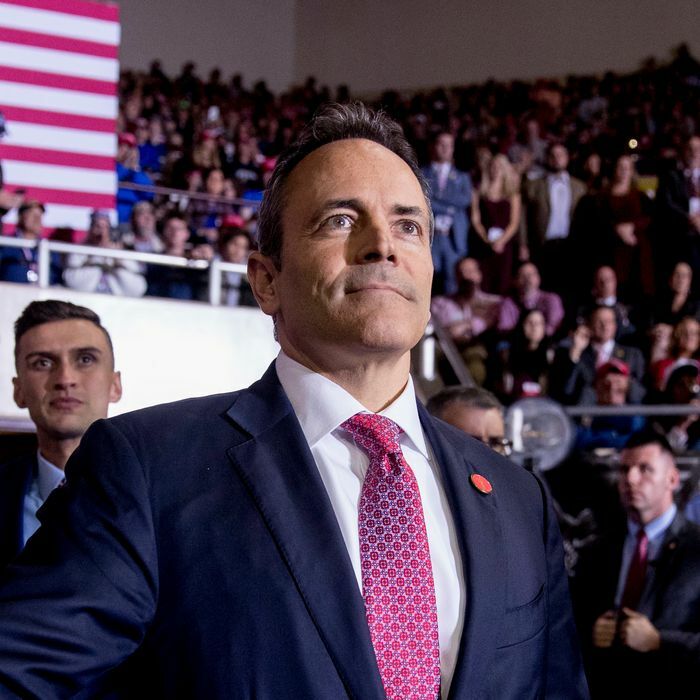 It has a Democratic governor largely thanks to a Republican incumbent who screwed up even more egregiously than Matt Bevin: former wiz kid, congressman, and failed presidential candidate Bobby Jindal. Edwards, who was a Democratic leader in the state legislature, also benefited from a moderate-to-conservative ideological profile and a weakened opponent. That was U.S. Senator David Vitter, whose admitted patronage of a prostitute back in the day came up again and again as he struggled to beat other Republicans for a clear shot at Edwards in a runoff under the state’s “jungle primary” system. As Edwards runs for reelection, he can boast of a bipartisan tax increase that closed the terrible fiscal deficit Jindal left, and a popular Medicaid expansion that Jindal — fearing conservative presidential primary voters — had blocked. In a less religiously conservative state, his signature on a patently unconstitutional bill seeking to ban abortions after 15 weeks of pregnancy might have caused a Democratic backlash. But it may well help his reelection in Louisiana. He also has some support from prominent Republicans, as he did in 2015. Edwards’s best reelection break was the decision by U.S. Senator John Kennedy to decline a much-rumored race for governor. Northern Louisiana congressman Ralph Abraham quickly jumped into the ring along with self-funding businessman Eddie Rispone, and state treasurer John Schroder is also mulling a candidacy. As of October, Morning Consult showed Edwards with a good-but-not-great approval ratio of 47/34. Like Bevin, Edwards is rated a modest favorite by Cook Political Report. But with Bobby Jindal gone and partisan polarization on the steady rise, it could be close. And you have to figure Donald Trump will intervene early and often in the state he carried by nearly 20 points in 2016. 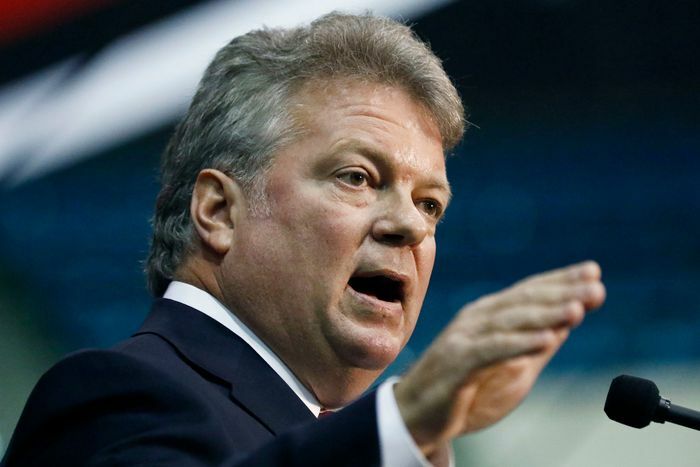 Mississippi: Can Jim Hood turn this deep-red state momentarily blue? Mississippi’s conservative incumbent governor Phil Bryant is term-limited, and both parties have putative candidates who have held statewide office since 2003. Republican lieutenant governor (and former State treasurer) Tate Reeves is the presumed Republican nominee, likely facing Democratic attorney general Jim Hood. Jim Hood speaks with a folksy twang. He says grace before dinner and styles his hair like the late country singer Conway Twitty. An American flag nearly as long as Hood juts from the brick portico of his suburban Jackson, Miss., home, and just inside the front door, he keeps a Good News Bible in plain view for guests to peruse. Out back he stores his tractor and guns in a woodshed and on days when he needs to get his mind off work as Mississippi’s attorney general, he retreats to the shed, where he takes used ammunition casings from his weekend hunting excursions and reloads them manually, shell by shell. Tate Reeves is what you’d expect from a veteran Republican officeholder in a state like Mississippi: He regards corporate subsidies as essential to economic development, wants to keep government small, and loves him some Donald Trump. Had perennial right-wing gadfly Chris McDaniel done better in his special election race for senator this year (he finished a poor third behind Cindy Hyde-Smith and Mike Espy), perhaps his talk of challenging Reeves would be more menacing. There’s even been occasional buzz about 77-year-old ex-senator Trent Lott getting into the race. But Reeves will likely be the nominee. Perhaps the key thing for Hood will be to build on the turnout performance registered by Espy in his unsuccessful but impressive runoff race against Hyde-Smith in late November. If he wins, it would rank up there with Doug Jones’s 2017 Senate win in Alabama as a hopeful Trump era sign for southern Democrats, albeit less satisfying to progressives than a Stacey Abrams or Andrew Gillum victory would have been in November. With the Louisiana and Mississippi gubernatorial elections being in the area no longer protected by an effective Voting Rights Act, and with Republicans running the election machinery in both states, voting-rights issues could again matter a lot in 2019. State legislatures: Virginia offers Democrats a trifecta opportunity. Republicans hold comfortable margins of control in both legislative chambers in Louisiana and Mississippi, which hold elections for all seats in 2019. Democrats have a large margin of control in New Jersey’s lower legislative chamber, which is up in 2019 as well. So barring something unexpected, the state legislative drama will be in Virginia, where Republicans hold a 51/49 majority in the House and a 21/19 majority in the Senate with all seats up. Given recent Democratic gains in the state in the 2017 state elections and 2018 congressional contests, a pre-redistricting trifecta (with Governor Ralph Northam in office through 2021) looks entirely possible. Mayors: Who will replace Rahm Emanuel? There are a host of municipalities (and counties) holding elections this year, with many major cities electing mayors. Term limits will force new mayors into office in Chicago, Dallas, Kansas City, and Tampa. The most interesting early race will likely be in Chicago, where 16 candidates are expected to qualify for a February 26 election (with an April 2 runoff) to succeed Mayor Rahm Emanuel. Phoenix will hold a March 12 runoff for a mayoral special election held last month, with two Democrats, Kate Gallego and Daniel Valenzuela, contending for the position. And oh yes: The “invisible primary” for the 2020 Democratic presidential nomination will be ongoing throughout the year.